With Oahu’s only five-diamond, five-star restaurant and glass mosaic-tiled freshwater pool, Halekulani more than lives up to the translation of its name “house befitting heaven.” Situated on five oceanfront acres in Waikiki, the resort is a heavenly oasis of tranquility with a touch of history, as its original main building was built at the turn of the century. SpaHalekulani, which showcases art and artifacts from Hawaii and the South Pacific, opened in April 2003 and is the creation of spa designer Sylvia Sepielli. The Mobil Four-Star spa, the first in Hawaii to incorporate the healing traditions on the South Pacific, offers a private suite experience and allows guests to select from four treasured signature experiences: the Elegant Passage, the Heavenly Journey, the Grand Voyage and Romance Remembered. The award-winning SpaHalekulani balances a gracious blend of authentic Polynesian healing treatments and stylish, convivial flair that reflects Oahu’s spirit. There are seven "suite-style" treatment rooms, including a garden lanai suite and couple’s room with a Japanese furo, in the 5,500-square-foot spa; additional highlights encompass a boutique shop, full-service salon and outdoor lanai lounge for guests to enjoy before and after services. Sylvia Sepielli-designed interiors, accented by a Shoji Japanese sliding door, Sudari-style tropical grass window coverings and Thailand-imported bleached tropical wood, help create a lasting impression. Signature rituals showcase influences from the Pacific Island, including Samoa, Tonga and Tahiti, and select therapies feature fresh island ingredients such as coconut, Halekulani orchid, Maile and papaya. Options include the Polynesian Nonu, Pohaku and lomilomi massages, as well as the Polynesian Steam Therapy. Guests can be as young as seven; teen and tween spa services are available. Guests can lounge by the oceanfront, freshwater swimming pool, comprising 1.2 million pieces of South African glass mosaic tile depicting a Cattleya orchid. There is also the beach with all the watersports guests might imagine, from surfboard rentals to sailing; arrangements for off-site excursions like outrigger canoeing, deep-sea fishing, surfing and snorkeling can be made via the concierge. Several on-property boutique stores are available to peruse, and for those who don't want to interrupt their exercise regime, there is a fitness center equipped with Technogym and Kinesis equipment. A good number of workout classes are offered, including aerobics, water aerobics, stretching, yoga and muscle toning. The surrounding area includes such landmarks as Diamond Head, Pearl Harbor, Iolani Palace and Pali Lookout. 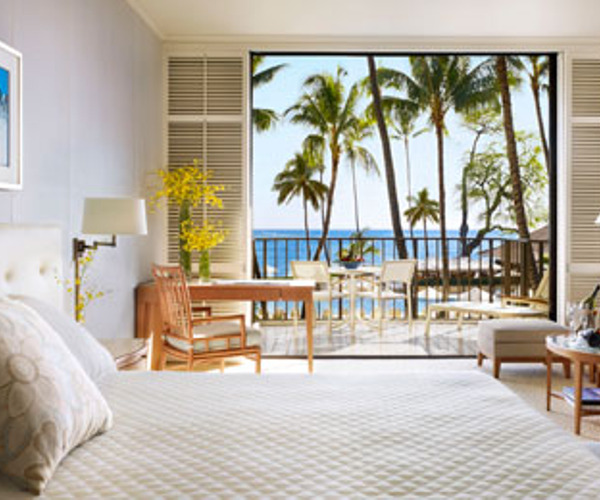 Guest rooms have garden or ocean views and feature large lanais averaging 100 square feet. A fruit basket and Halekulani chocolates welcome guests upon arrival, and the ceramic-tile bathrooms are made all the more memorable with separate glassed-in shower and deep soaking tub, marble vanities and over 15 personalized amenities, from sun screen to mineral salt tablets. Other thoughtful details include LCD high-definition TVs, complimentary high-speed Internet access and MP3 docking stations. 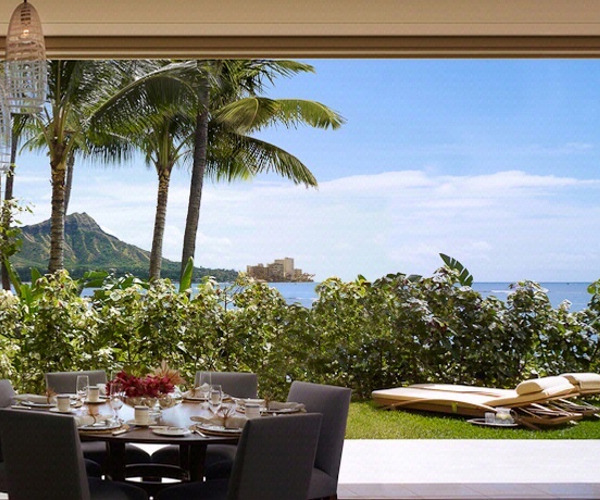 Halekulani provides four dining options with spectacular ocean vistas, inviting guests to never leave the property. There is no shortage of variety and superlative cuisine, from the multi-level garden restaurant, Orchids, which serves contemporary seafood like ahi crudo and Kahuku shrimp ravioli, to the indoor/outdoor House Without a Key, known for its signature mai tais, sunset views and live entertainment. Guests can also opt for neoclassic French fare at the award-winning Le Mer and light dishes and live jazz at Lewer’s Lounge.